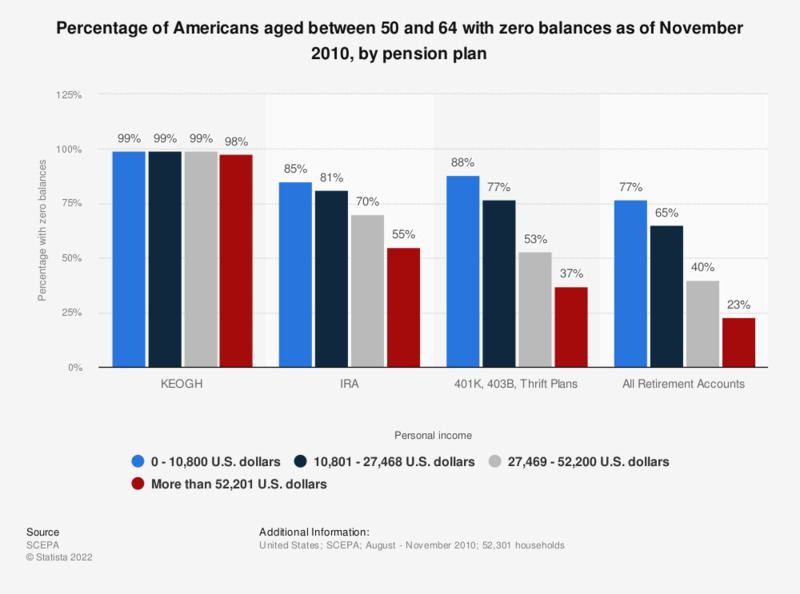 The statistic shows the share of Americans aged between 50 and 64 with zero balances in various pension plans in 2010. The categories are divided into income quartiles ranging from 0 to 10,800 U.S. dollars in the bottom 25th percentile to more than 52,201 U.S. dollars in the 75-100th percentile. The percentage of Americans in the bottom 25th percentile who had zero balances in KEOGH pension plans amounted to 99 percent. The source provides no information regarding how exactly the interviews were conducted. According to the source there were: 14,595,911 Americans that fell into the $0 - $10,800 income category (bottom 25th percentile), 14,485,878 Americans in the $10,801 - $27,468 (25-50th percentile), 14,534,878 Americans in the $27,468 - $52,200 (50-75th percentile) and 14,528,221 Americans in the more than $52,201 (75-100th percentile).